When Scott Campbell of Maine Mountain Post & Beam builds something, he does it with careful forethought and intense preparation. From repairing and reassembling antique barns to custom cutting a new timber frame, each building has it’s unique needs to consider. So when he finally decided to put up a timber frame for himself as a shop he made sure to research each and every aspect of the building. Located in the western mountains of Maine, weather is always an issue. 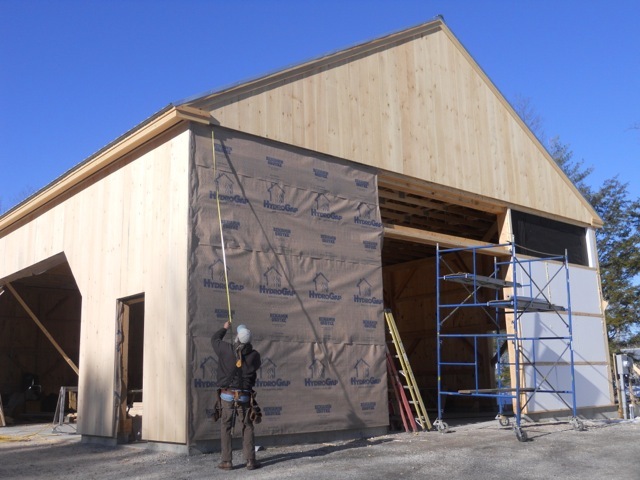 Scott was sure he wanted to use vertical siding (a traditional siding for a New England barn) but because of the nature of vertical siding he was concerned about water leakage within the frame. He needed a housewrap to allow moisture to drain and protect the wall from mold and rot but also that could be installed vertically and easily. HydroGap is the only housewrap that can be applied both vertically or horizontally without affecting drainability. The lighter weight of the 5 foot rolls (only 17 pounds) helped speed the process so Scott could finish his shop efficiently and effectively with the peace of mind that the building will be protected for many years to come. Scott’s business is a step back into the world of old. He’s disassembling, repairing and reusing buildings that have lasted for hundreds of years. And he’s able to incorporate modern building products with the traditional techniques so the integrity of these buildings will last for generations to come. Maine Mountain Post & Beam specializes in the dismantle, repair and re-assembly of antique timber frame structures. Working nationwide, the timber frame company also designs and cuts new frames basing most of the designs on the traditional framing styles of New England. See www.mainemtpostbeam.com for examples of Scott’s work.